Leadership skills have evolved over the years. In the modern, digital age we need a new generation of professionals who can manage change and lead with confidence. If you enjoy helping others face new challenges and creatively solve problems to reach their full potential, a master’s degree in strategic leadership will help to achieve your goals. 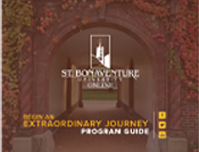 St. Bonaventure University’s 100% online leadership program allows you to earn your degree while working full-time. The comprehensive curriculum touches on multiple aspects of modern leadership that every business needs including diversity, human resources, and global leadership. Here are some helpful tips to improve your leadership skills and a glimpse of what you will learn. Effective communication is the key to a team’s success. A leader sets goals and communicates his or her expectations that an organization seeks to fulfill. Lack of communication leads to friction and demotivation. Verbal communication skills are essential for every leader. Sharpening your communication abilities goes hand-in-hand with improving your leadership skills. One way to develop your speaking skills is to prepare for conversations in advance. Leaders need to master the arts of writing and body language as well. A degree in strategic leadership will guide you through the process of mastering different types of communication. Strong communicators make extraordinary leaders, and the program will teach advanced written and verbal communication techniques that will make you stand out in the workplace. Leaders plan. Planning ahead will help you take on new projects, bring your vision to life, and achieve your goals. It can also reduce your stress levels which hamper progress. If you’re working towards a large goal, be sure to set clear milestones along the way. Celebrating small victories on your journey will put you in the best mindset to achieve your dreams. Young leaders should know the differences between strengths and natural talents. Some can learn quickly, some are known for their perseverance, while others have myriad talents that they have cultivated over time. A leader recognizes his or her strengths and works on honing their natural abilities. Another critical aspect of leadership is to recognize the strengths and talents of others. A leader motivates team members to apply their knowledge in their work. An effort like this goes on to create a strong and successful team. When researching strategic leadership degrees, look for an accredited program with experienced faculty in a format that works best for your lifestyle. The online Master’s of Arts in Strategic Leadership at St. Bonaventure University can be completed in as little as one year, and helps students to identify and build on their strengths. St. Bonaventure University is ranked #1 in New York state and #2 in the North for “Best Regional University Value” by the 2019 U.S. News & World Report. With a master’s degree in Strategic Leadership from St. Bonaventure you will develop problem-solving, team management and strategic communication skills that will help you excel as a leader.